1931 photo, showing shields at right for US 11E, US 19, and US 321. Bristol is a city straddling two states. 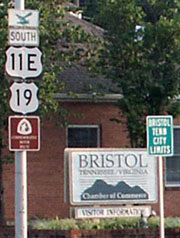 The photo above was taken looking east on State Street, which runs along the boundary between Virginia and Tennessee, and thus also serves as the dividing line between the municipalities of Bristol VA and Bristol TN. Together these cities form an urban area referred to simply as "Bristol". 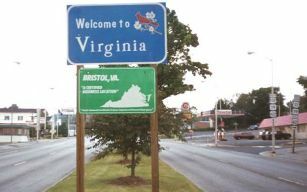 Historically, several three-digit US routes have ended in Bristol. Most of them were during the seminal years of the system, and none of them terminated in Bristol for long. 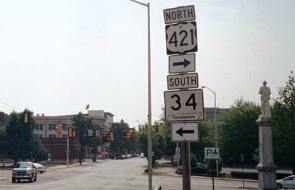 In the beginning, US 411[i] came in from the west, meeting US 11 on the west edge of town (at the point where US 11W and 421 split now). 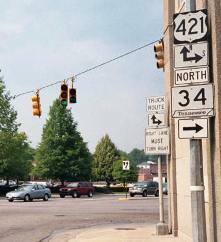 But US 411 probably did not end there at its junction with US 11; at least one map shows US 11-411 overlapped into the downtown area. Meanwhile, US 511 came in from the south on Pennsylvania Avenue, then turned west on State. 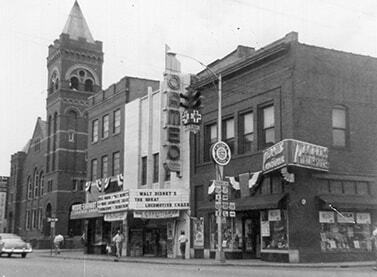 At Front Street (more recently known as Randall Street, and today as Martin Luther King Jr. Blvd. 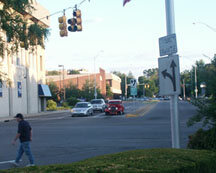 ), northbound US 11 was to the north, while southbound was straight ahead on State. 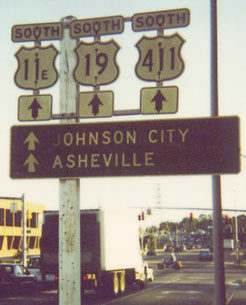 So US 511 ended there, and most likely that was where US 411 began. last updated Jan. 20, 2017.